Motorola Mobility has unveiled its first Intel-powered smartphone this morning at a media event in London. The Razer i looks almost identical from the outside to its US counterpart, the Droid Razr M, and shares a few specs with it too: a 4.3-inch (540x960) edge-to-edge AMOLED display, 8MP camera, Kevlar back panel and a 2,000 mAh battery. But beyond that the Razer i is the first to pack an Intel Atom chip clocked at 2GHz. It isn't a dual-core part, but it does support hyper-threading, and Intel claims it stacks up well against the competition. Battery life is rated for 20 hours of "mixed use" time, despite the large screen and claims about performance. Motorola included its own Smart Actions software that can automatically switch off functions such as bluetooth connectivity and GPS location functionality based on usage patterns and remaining battery in order to improve the phone's longevity. Another aspect touted by the companies was the device’s camera, which can launch in under a second using a hardware shutter button (that its US cousin lacks) and capture up to 10 shots per second and 1080p video. On the software side, the Razr i will be launching with Android 4.0 Ice Cream Sandwich, but an upgrade to Jelly Bean is said to be coming sometime down the road. App compatibility on Intel's x86 architecture shouldn’t be a major cause of concern, though apparently Google’s Chrome browser still needs some work. Motorola said it didn’t want to pre-load Chrome as the default browser until they can achieve “complete chipset optimization”, but nonetheless users will be able to download the software from the Google Play store as an option. 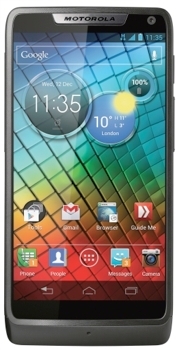 Motorola says that the phone will be available in October in the UK, France, Germany, Brazil, Argentina, and Mexico. The Razr i features a penta-band antenna, which means it can roam in the US, and is compatible with HSPA+ networks run by AT&T and T-Mobile. No pricing details have been announced yet.